Angel Perfume by Thierry Mugler, Not every perfume is as painstakingly created as this one. Only the best are created by experts in laboratories and tested over and over again until they are perfect. One such brand of perfume is Angel. 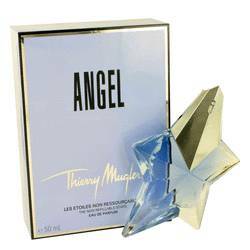 Angel perfume by Thierry Mugler was made by the design house of Thierry Mugler in 1992 by perfumers Yves de Chiris and Olivier Cresp. The Angel fragrance is considered to be the first gourmand perfume. Angel by Theirry Mugler is classified as a refreshing, woody, oriental fragrance. It is replete with mouth-watering berries, candy floss, creamy caramel, and oriental spices. For years, Thierry Mugler has designed by instinct, and he never needs to look for inspiration: It just comes to him. Perhaps it’s no surprise, then, that he became an icon of the perfume industry with incredible scents such as this one. The ground-breaking Thierry Mugler Angel perfume has been one of the best-selling brands of perfume for women over the past 20 years, which should come as no surprise to anyone who has ever caught a whiff of it. This feminine scent includes notes of dewberry, bergamot, mandarin, red berries, honey, patchouli, coumarin, Australian sandalwood, caramel, vanilla, and chocolate combined into one to make a spectacular perfume. Angel, Thierry Mugler’s masterpiece, is truly a scent for the everyday woman who wants to evoke sexiness and power. Our Angel perfume for women and all of our other Theirry Mugler products are guaranteed to be authentic: We do not sell knockoffs of Angel. Theirry Mugler has been a trusted brand in the perfume industry for years, and we are looking to preserve that trust and integrity. Shop online today at Perfumeuae.com and save when you buy the best in perfume. Angel is just one of the many wonderful brands of perfume and cologne that we have for sale: We carry a wide selection of scents suitable for any recipient, and we also carry coordinating bath and body products and even gift sets. In addition, we offer free shipping, so we make it easy to give the gift of scent to someone you love today!